Block 2 School Double Bout! Newcastle Roller Girls are currently taking a well earned summer break, but they will be back with a bang in September to bring you two home bouts in as many weeks! 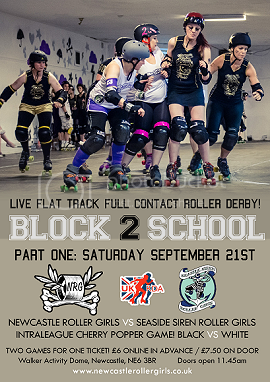 The Canny Belters take on the Seaside Siren Roller Girls, followed by an intraleague cherry popper game between NRG Team Black and NRG Team White – made up of our B team skaters and rising stars! The Canny Belters are finally having a rematch against Manchester Roller Derby’s Checker Broads who pipped the Geordie girls to the post when the teams last played in Walker in July 2012. 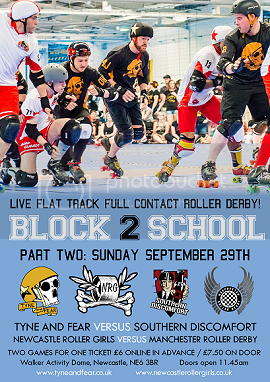 Then Tyne & Fear who finished at the Men’s European Roller Derby Championships 2013 this summer in third place will be taking on the second place team, none other than London’s Southern Discomfort! Tickets for the single games will be £6 in advance or £7.50 on the door – but you can also purchase a special double weekend ticket and go to both events for just £9, saving a whopping six pounds on the individual door prices. The games will take place at our home the Walker Activity Dome, Wharrier Street, Newcastle Upon Tyne,NE6 3BR. ADVANCE TICKETS SOLD OUT – get there early on the day to avoid disappointment!